Better Data Storage controls and statistics in Settings | Data Storage. Fastvue Site Clean is definitely the biggest and most exciting new feature for the 3.0 release, and for web reporting in general. It is is the ‘secret sauce’ Fastvue has been working on for a long time now. Reporting on web activity using log data from your firewall or proxy has become an almost impossible task due to the way modern websites are architected. A typical website consists of advertising banners, site analytic scripts and social sharing widgets, and the site’s content itself is served from content delivery networks (CDNs). Although you’re simply reading an online news article, behind the scenes, your browser is visiting dozens of weird and wonderful sites such as akamaihd.net, doubleclick.net, google-analytics.com, and even facebook.com thanks to that handy ‘Like’ button on the page. Fastvue Site Clean takes into account other characteristics of web browsing data including referrer URL, MimeTypes and categories, along with a frequently updated web service, to provide a more accurate picture of web browsing activity. We’re very excited to bring this feature to you, and we hope your web reports start making a lot more sense from now on! For more information, take a look at our dedicated page on Fastvue Site Clean (work in progress). One of the most popular feature requests for Fastvue TMG Reporter since its release, is the ability to securely share a report with someone, without them being able to access other reports or features of the application. In Fastvue TMG Reporter 3.0, whenever you schedule, share or email a report, you have the option to do it ‘privately’. When someone receives a link to a private report, they see only the report, not the full application such as the Settings tab and so on. Private Reports are served from the /p folder in the website, which can be made available to all or specific users, while the rest of the site is locked down to administrators using IIS (see our article on How to secure and publish the Fastvue TMG Reporter Website). The ‘Private’ option is presented when sharing and emailing reports, as well as when Scheduling Reports. To get started, click the Share button when viewing a report, or edit your existing Scheduled Reports (Settings | Reports | Scheduled Reports) and turn on the ‘Private’ option. Inline with our commitment to make web reports more meaningful, we are introducing new embedded Gantt bars within Activity Reports. These green bars provide a useful visualization of when and how long websites were visited. 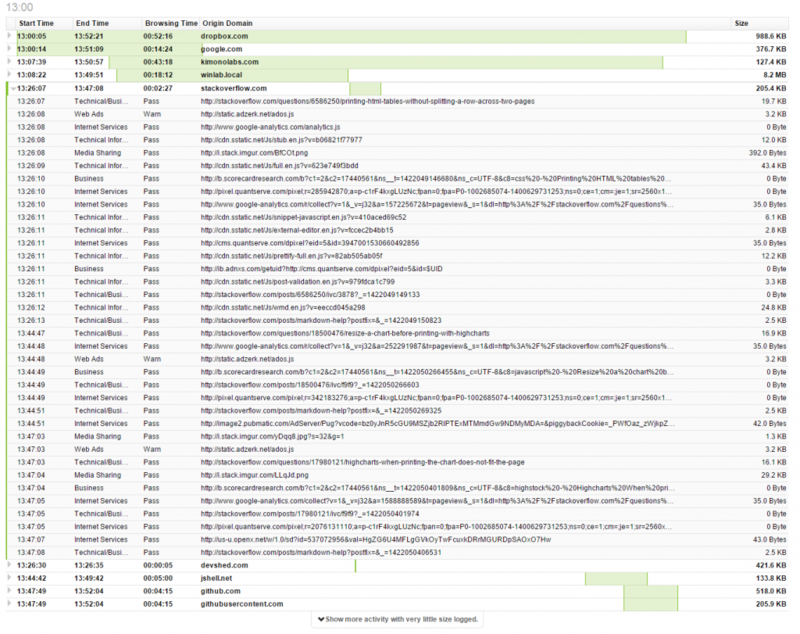 You can easily identify which sites were browsed the longest and then click on the rows in Activity Reports to view full URLs, timestamps and categories. Activity Reports utilize the new Fastvue Site Clean feature so all the ‘junk’ domains will be rolled into the ‘actual’ site someone was looking at. We hope you enjoy the many other features and fixes that come with this release, including Export to CSV throughout the application, improved Data Storage visibility and data retention estimations, Search Terms in User Overview reports, the reworked Productivity Dashboard and more. As this is a beta, you may like to install it separately on another machine or VM while testing. Be sure to add the new machine to Forefront TMG’s access rule that allows communication between the Fastvue Arbiter and the Fastvue server (Port 49361 TCP outbound from the Fastvue Server to localhost for All Users). See our Getting Started guide for more information. If you want to upgrade your existing installation to the beta, we recommend backing up your existing settings and data first. This is as simple as making a full copy of the contents of TMG Reporter’s data location, shown in Settings | Data Storage | Settings (default is C:\ProgramData\Fastvue\TMG Reporter). More detailed installation and upgrade instructions are presented after downloading the software above. This is a beta, so please report any issues or questions via our Support Portal. We look forward to hearing from you!